» Can We Trust the Reds? Pardon the headline, stolen from one of Sen. Joseph McCarthy’s earliest masterpieces, but there’s a situation brewing. The Cincinnati Reds are 33-27, and hold a one-game lead in the NL Central. The last time the Reds won the division was 2010, but the last time they actually won a game in the postseason was 1995, when they swept the Dodgers in the wild-card round before falling in four to the Braves in the NLCS. Is this year’s club poised to end almost two decades of futility? Are the Reds for real? Let’s ask ourselves some important questions to unravel the mystery. After each, we’ll give the Reds either 0, .5, or 1 Real Point, and we’ll see where they stand at the end. 1. What does run differential say about the future of the NL Central? Have the Reds been lucky? Yes, but only a little. Their current run differential is +22, and if you factor that proportionally over the 60 games they’ve played, you’d expect them to have a record of 31.35-28.65. (In this hypothetical world, I imagine the .35 win would have come against Houston, after the ‘Stros signed it away in exchange for a shipment of gloves that weren’t made from cardboard.) Instead, the Reds are 33-27, or a little less than two games above the expectation curve. But what about the rest of the NL Central? Well, the Pirates are a game out. They have a great pitching staff, at least so far, but calling the offense anemic is an insult to iron-deficient people everywhere. It’s the worst in baseball, and Pittsburgh’s 32-28 record is about four games above what you could expect from a -19 run differential. In other words, they’ll probably collapse like they always do. The problem, of course, is the Cardinals, whose +50 differential seems to indicate that better things are in store than their current 31-31 record. The Reds can expect a furious chase from their rivals as we head into summer. 2. Do they have an offensive superstar? Joey Votto is an insane hitting machine and arguably the best player in baseball. His .464 wOBA leads both leagues, as does his .479 OBP and a 1.121 OPS. He’s hitting for power and average, and his walk rate is unmatched, meaning he’s both selective and feared. 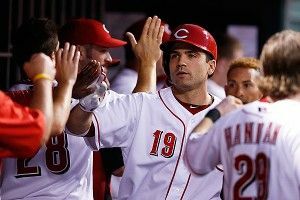 Put simply, Votto would be the runaway choice for National League MVP if the season ended today. The only note of caution is that his average on balls in play is .423, which can only come down. But even with that correction, he’s on pace for a superlative season. 3. What about the rest of the offense? That’s where it gets dicey. Todd Frazier, who has been my hero since he won the Little League World Series for Toms River, New Jersey, in 1998, is having a nice year with a .277/.333/.598 line. Beyond that, Jay Bruce and Ryan Ludwick are hitting for a little bit of power, and Ryan Hanigan has a decent average, but there’s not much else. All told, the Reds are 10th in the National League in run production, and those numbers aren’t impressive even in the Central. Cincinnati has the highest fielding percentage in the National League, for whatever that’s worth. But when you factor in UZR, they’re middle of the pack. Again, I emphasize: for whatever that’s worth. I’m sure brighter minds will contradict this, but from my cursory study over the years, team defensive stats (advanced or standard) have basically no correlation to wins and losses. 5. Let’s get serious: Who’s the ace? Johnny Cueto! The diminutive righty’s latest coup came Tuesday night, when he threw a complete-game six-hitter against the Indians, allowing just one run. It was good timing, too, since several of his teammates (including Votto) had to receive IV fluids before the game due to a stomach bug making its way through the clubhouse. Cueto is a joy to watch, and it might be because he’s a short, crafty guy in the Pedro Martinez mold. It’s like David vs. Goliath during every at-bat, except David is a complete badass. He’s got the ninth-lowest ERA in the National League at 2.46, and he’s very efficient, with 87.2 innings pitched (almost seven innings per start). He’s lost a bit of speed on his fastball so far this year, but it’s still one of the most valuable pitches in the NL. At 7-3, he’s the foundation on which the Reds rotation rests. 6. The rest of the starting staff? Rough going. Bronson Arroyo is the best of the rest, and it’s very debatable whether he’s a good option even as a third starter in a playoff series, much less a fourth. Mike Leake, Mat Latos, and Homer Bailey are seriously struggling. 7. How about the ‘pen? Amazing. With an ERA of 2.64, only the Pirates have fared better in the National League. That’s largely due to Aroldis Chapman, the fireballing reliever who was named closer a month ago. He’s allowed exactly four runs in 31 innings of work, good for a Rivera-in-the-postseason-esque 0.87 ERA. With a fastball that routinely tops 100 mph, it’s no surprise that he leads everyone in strikeouts per nine innings. He’s one of the premier forces of nature in the game. But he’s not the only one. Jose Arredondo, Alfredo Simon (who only seems to pitch in losses), J.J. Hoover, and Logan Ondrusek are all having good years. Even Sean Marshall has been effective after losing the closer’s role, lowering his ERA a full point over his last 10 appearances. Some minor stuff, but nothing mojo-killing yet. Only the loss of closer Ryan Madson for the year was a major blow, but as we’ve seen, the bullpen hasn’t skipped a beat. So that’s 5 possible Real Points out of 8, for a Real Percentage of 62.5 percent. And hey, guess what their current playoff odds are, courtesy of CoolStandings.com? 61.2 percent. It’s just like real science!